"I never heard anyone say I like Apu because he exposes the idiocy and bigotry of the average American and showed the struggle of the immigrant," comedian Hari Kondabolu says in his documentary "The Problem With Apu." And yet part of the reason Apu has remained a central character to "The Simpsons" is that, over many seasons, he has been provided with backstories and human flaws. 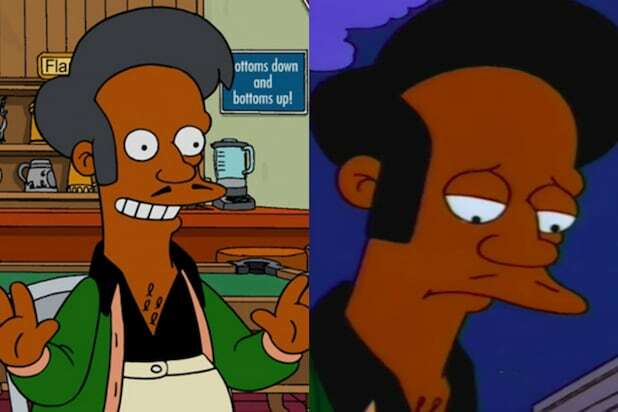 Yet still, the discussion about Apu's stereotypical roots, how he's voiced by white actor Hank Azaria, and whether the character should remain on the show, still continues. Below, we've examined some of Apu's most prominent moments on "The Simpsons" and how these have shaped the character and the controversy around him. "The Telltale Head" (Feb. 1990) Apu's first appearance came in the series' eighth episode, in which Bart orders four Squishees for his friends, only to realize he was used as a distraction so they could steal while Apu's back was turned. "A Streetcar Named Marge" (Oct. 1992) and "Marge vs. the Monorail" (Jan. 1993) These two episodes are early instances of Apu singing, which Kondabolu says in the film makes him a minstrel character. 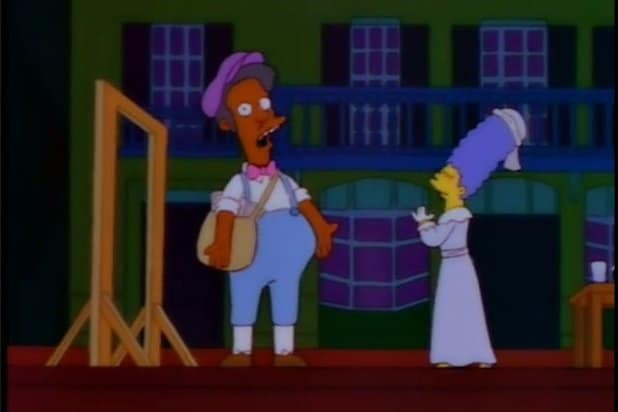 The first comes in a musical production of "A Streetcar Named Desire," where Apu has a small walk-on part in the stage play and gets a brief solo. Apu's accent gets laid on thick before he yelps in excitement when Marge kisses him on stage. In the Monorail episode written by Conan O'Brien, Apu sings, "Is there a chance the track could bend?" which is rhymed with, "Not on your life, my Hindu friend." 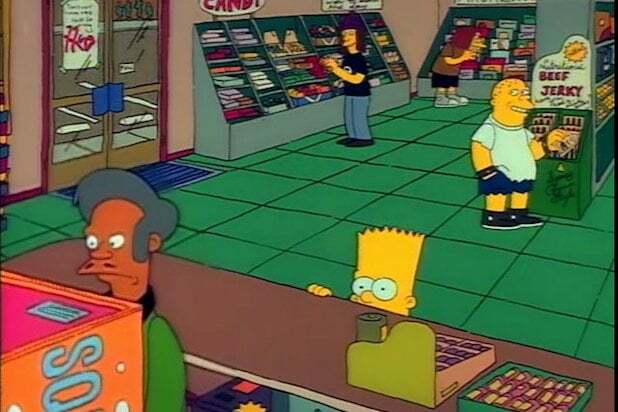 "Marge in Chains" (May 1993) In this episode, Apu prosecutes Marge for shoplifting after she accidentally tries to walk out of the Kwik-E-Mart with a bottle of bourbon. He and Sanjay celebrate with stereotypical sounding Indian music. And on the witness stand, he reveals he knows the number pi to 400,000 digits. "The last number is one," he says. "Homer's Barbershop Quartet" (Sept. 1993) In this Beatles parody, Homer, Principal Skinner, Apu and Barney form a barbershop quartet and hit super stardom. But before they do, an agent tells Apu that he has to change his last name when he reveals for the first time it's Nahasapeemapetilon. The agent says it'll never fit on a marquee, to which Apu responds, "it is a great dishonor to my heritage and my God, but OK!" And when a reporter asks Apu if he's actually Indian, he denies it by saying, "By the many arms of Vishnu, I swear it's a lie." "Homer and Apu" (Feb. 1994) This fifth season episode was the first dedicated solely to Apu. Homer poses as an (unwitting) informant who gets Apu exposed, shamed and fired for selling spoiled, rotten food at exorbitant prices. He then comes to Homer with his hands outstretched, which Apu explains is a gesture of apology, and not as Homer initially interprets -- Apu coming to strangle him. After a quick song-and-dance number, they travel to India to the first-built Kwik-E-Mart, perched on top of a massive mountain, to win Apu's job back. The Indian CEO of the Kwik-E-Mart repeats Apu's "Thank you, come again" catch phrase and is voiced by Harry Shearer, also a white man. Once back in Springfield, Apu takes a bullet for guest star James Woods, who gets Apu his job back. "Lisa the Vegetarian" (Oct. 1995) In this episode, Apu reveals that he's a vegan. With a little help from his friends Paul and Linda McCartney, Apu teaches Lisa -- who has converted to being a vegetarian and insists on lecturing everyone in her family -- a lesson about tolerance in the process. He explains that he met Paul back in their Maharishi days in India and came to be known as "The Fifth Beatle." He then regales Lisa with his own rendition of "Sgt. Pepper's Lonely Hearts Club Band," sung in Apu's thick dialect. "22 Short Films About Springfield" (April 1996) This episode provides a rare glimpse into Apu's social life, in which his brother Sanjay convinces him to take five minutes off work for a party. He very quickly paints the town red, even getting in a quickie in a pool shed ("no ring I see, so you are only arranged to be married"), before heading back to a life of eternal work at the Kwik-E-Mart. "Much Apu About Nothing" (May 1996) Another landmark episode for Apu. When a wave of anti-immigrant sentiment hits Springfield, Apu reveals that he's a "semi-illegal alien." The episode dives into Apu's backstory and Indian heritage in a way no episode had previously. He says he graduated first in his class out of 7 million students from Caltech, "Calcutta Tech." He then came to America to study before taking a job at the Kwik-E-Mart to pay his student loans, but kept the job because he loved the work. Apu passes his citizenship exam and gets to remain in Springfield legally. It's also worth noting that all of the actors voicing Apu's family in flashbacks are done by white actors. "The Two Mrs. Nahasapeemapetilons" (Nov. 1997) Apu briefly plays the ladies man in Springfield before his mother contacts him from India, informing him that his arranged marriage, set up when he was a child, will now come to pass. He makes an excuse that he's already gotten married and convinces Marge, Bart and Lisa to pose as his wife and kids. His ruse doesn't last when Apu's mother comes to visit, but he immediately takes to his bride to be, Manjula, who has since become a recurring character. Apu and Manjula have a traditional Indian wedding, which Homer tries to spoil by dressing up as a Hindu god. An academic in Kondabolu's documentary points to this episode as how Apu's backstory isn't necessarily specific to Indians but rather to south Asians broadly. "Eight Misbehavin'" (Nov. 1999) Apu finds that Manjula was slipped too many fertility drugs by the Simpsons in an attempt to get pregnant, resulting in the Nahasapeemapetilons giving birth to octuplets. In their desperation to care for them, Apu is seen wearing a makeshift bladder on his chest that holds eight milk bottles, and Manjula resorts to carrying two babies while balancing a laundry basket on her head. "The Sweetest Apu" (May 2002) When Apu gets caught cheating on Manjula with one of his delivery ladies, the show probed the couple's marital problems in much the way it did with Milhouse's ultimately divorced parents. "Kiss Kiss Bang Bangalore" (April 2006) When Homer is sent to Bangalore to lead the nuclear power plant's outsourcing, Apu tells him to meet with his cousin, described as having medium height, dark complexion, brown eyes and black hair, the joke being that this describes just about everyone in India. Homer looks out over thousands of faces and starts surveying the crowd, but manages to find Apu's cousin after asking just two people. While his cousin being based in Bangalore suggests Apu's South Indian heritage, an earlier episode says he's from Rahmatpur in West Bengal. "Much Apu About Something" (January 2016) Several years before Kondabolu made his documentary, "The Simpsons" addressed the Apu controversy with an episode in which comedian Utkarsh Ambudkar voiced Apu's millennial nephew, who confronts Apu for being a stereotype. But Ambudkar ultimately was disappointed by the episode, saying in Kondabolu's documentary that the show then undercut his monologue with the equally stereotypical Luigi, shrugging that all of "The Simpsons" characters are caricatures. "No Good Read Goes Unpunished" (April 2018) Apu doesn't appear in the episode where "The Simpsons" address his controversy, but a photo of him with the line "Don't have a cow man" appears next to Lisa's bedside. Marge has redacted all the offensive lines from an old book that used to be her favorite, which Lisa says has made it lose all its value. "Some things will have to be addressed at a later date," Marge says. "If at all," Lisa replies, before glancing at the photo of Apu. The episode was widely criticized as being an inadequate response, including by Kondabolu. At TCA on August 2, Fox CEO Dana Walden responded to a question about Apu as the show enters its 30th season. "We have had conversations with Jim Brooks and his team, and basically, we’ve left it up to them. I think that they’ve treated the show and the characters on the show with so much respect, we definitely trust them to handle it in a way that will be best for their show. I’m not sure yet exactly what they’re going to do, but ultimately, we all decided that it was their decision." After first saying that "people love to pretend they're offended, "Simpsons" creator Matt Groening readdressed questions about Apu, telling the New York Times that he loves the character, but sees the conversation as "tainted."